Breakfast can sometimes be hard for a Fussy Foodie. Porridge or wheat-free toast are great, but sometimes you want to be able to grab some cereal on the way out the door – and if you’re anything like me, you’ll have just run out of homemade granola! Most standard breakfast cereals are full of sugar but luckily, the range of products suitable for those with multiple food intolerances has been improving greatly recently. 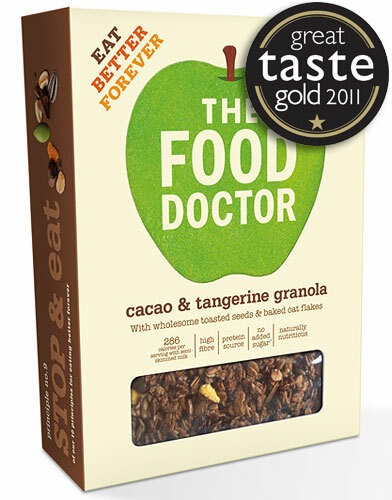 One of my absolute favorite healthy cereals at the moment is the Food Doctor’s Cacoa and Tangerine Granola. This lovely cereal is made with oat flakes (so not gluten-free unfortunately), seeds and agave nectar with lots of cocoa nibs and freeze-dried tangerine pieces thrown in. It’s hard to believe that something so yummy contains no cane sugar. 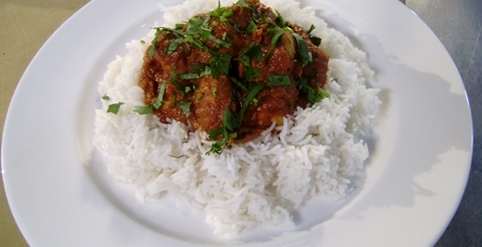 It has also won the Great Taste Gold Award for 2011. The Food Doctor’s Cacao and Tangerine Granola retails at £2.99 for a 425g box and is available on the Food Doctor website and in supermarkets (I picked it up from my local Tesco). This tastes nice, but has almost 20g Sugars, and Sugar (Agave Syrup is still a sugar!) is the second ingredient. This is not a good choice for Gi followers. Instead, I go for Rude Health’s Honey Nut Granola, with a lot less sugar and much better Gi due to its protein/Sugar/Fibre ratios.